I am here with another oriflame product review and i.e. 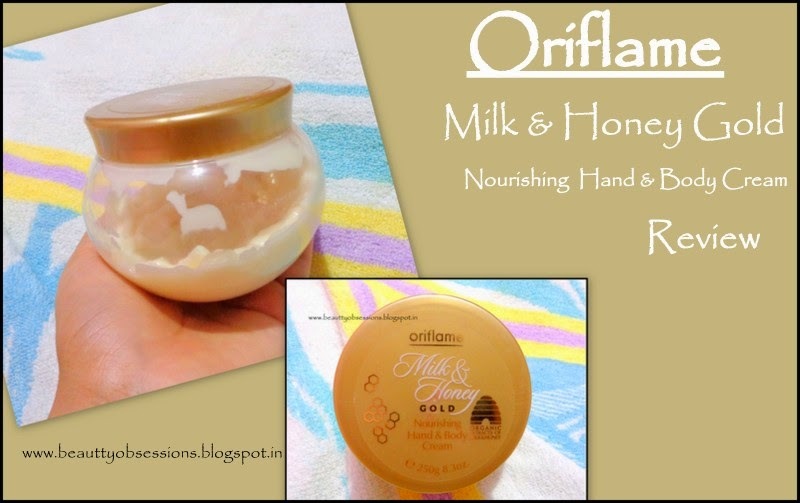 Oriflame Milk & Honey Gold Nourishing Hand And Body Cream . Before I have reviewed a face cleanser and night cream of the same range of Oriflame (Check Here and Here ). Now move below to know weather this one is a worth try or not..
Price : Rs529/- for 250gm. The packaging is very sturdy and travel-friendly.. It smells amazingly like other products of this range.. I totally love the fragrance. The texture is neither thick nor thin and it spreads on skin very smoothly and easily.That's why small quantity require for each use and the product lasts for a long period of time. It takes 10 seconds (maximum) to absorbed into skin . It moisturises my skin really very well (I have dry skin type and in winter it becomes more dry and this cream really moisturises in winter also). It is very light weight and non-sticky on my skin and will suit all skin type ..
One thing which i don't like is the price factor.. It is very pricy .. If you will buy during discount then it will be good. Final Verdict: BDW this body cream is a very decent and good product .. I am going repurchase this and will advice to buy during offer time..